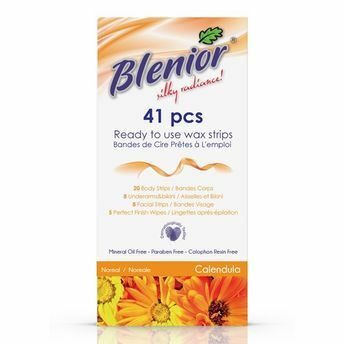 Blenior 41 Pcs Kit Cold Wax Strips offers practical use in all parts of your body with its "large-sized" wax strips for body and legs, "middle sized" wax strips for armpit and sensitive areas and "mini sized" wax strips for face and small details. It ensures that you get perfect results even with imperfect application techniques, the wax strips are effective on short hair as well. About the Brand: TreadA, the parent company of Blenior, was founded in 2006 with an aim to provide highest quality products that addresses customer needs. TreadA focusses on resin-based natural liposoluble wax products that are of premium quality. Being the first brand introduced by TreadA, Blenior provides various depilation alternatives for different parts of the body. All Blenior products are based on the satisfaction and happiness levels of people rather than price. Blenior caters to millions of satisfied customers across 18 countries in the world. The products are tested dermatologically and are safe to use. Explore the entire range of Shaving & Hair Removal available on Nykaa. Shop more Blenior products here.You can browse through the complete world of Blenior Shaving & Hair Removal .